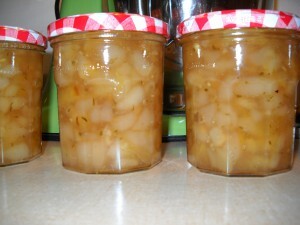 After some delays, on Monday I finally got around to my first attempt at pear preserves. I love pears, but I’ve usually been disappointed in preserves and jams made from them. Price doesn’t matter. Supermarket or boutique, the pear flavor has been weak to nonexistent; even added flavoring like ginger has been flat. I wasn’t optimistic about these pears, either. The neighbors had left them on the tree for a while waiting for them to ripen, but it stayed cool for so long that they had to pick them while still unripe. I think the prolonged chill adversely affected the flavor–after I let them ripen in a paper bag for a couple of weeks, they were okay, but lacked the usual rich pop you get from a tree-ripened pear. Anyway, went with this recipe from Emeril because it looked simple. Then, I made changes. Added 5 small apples leftover from my other neighbor’s donation because I wanted to add some pectin for thickening. Together with the pears, that resulted in 8 cups diced fruit. I read the recipe comments, and decided to cut back on the sugar because the pears were so sweet. So, 3 cups instead of 4. Added a couple of teaspoons of salt** because salt reduces the need for sugar and helps bring out the flavor of the fruit. 1/3 c chopped candied ginger instead of 1/4 c. Zest and juice of two limes because no lemons. And a tablespoon or so of fresh diced thyme because I thought the lemony taste would work well with the pears. You’re supposed to boil this stuff until the mixture “sheets off a metal spoon.” I may have let it go too long because I wasn’t sure how sheety the sheeting needed to be. In any case, the stuff thickened until it entered the marmalade/borderline candy realm, with pears, apple, and ginger all turning translucent. I shoveled it into 4 Bonne Maman jars–yes, I reuse them–and stuck it all in the fridge to cool. It’s good. Different than anything I have ever had before. I’ve eaten it smeared on bread with Brie, on toast with butter. On a turkey and cheddar sandwich. It has a combo flavor–not quite any single thing, but a mix of the ginger, thyme, and pear. It’s waaay thick, like commercial preserves. I would make it again. Might even reduce the sugar a little more. **thinking back, not 100% sure whether I added 1 tsp, 1.5, or 2. I used a half-teaspoon measuring spoon, so I know I shoveled a couple of times. I’m afraid I cook like my mom–a little of this, a little of that, and how much of this did I add again? So, salt to taste. Not too salty.